SO this is how it went last night: I slept not so fitfully after tearing my hair out over the new BIR tax form. But I wake up this morning, and after reading emails, logged on to Facebook as usual. And whoa! 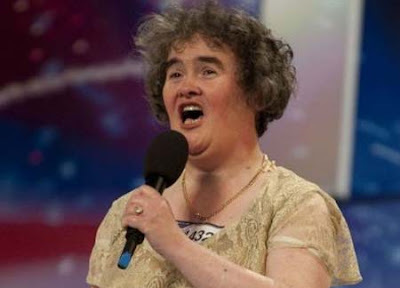 All my friends had posted videos of the brilliant nobody "never-been-kissed" Susan Boyle singing, "I Dreamed a Dream" (Les Miserables) on Britain's Got Talent. She wowed the cynical audience and equally cynical judges Piers Morgan, Amanda something, and even grumpy old Simon Cowell! Haha. She earned three enthusiastic yes-es for her truly inspiring performance. Just goes to show dear Melanie Marquez was right: "Don't judge my brother, he's not a book!" Btw, this is the same show w/c discovered Paul Potts. Definitely, this TV show is much bigger in the UK than American Idol, because of the wonderful surprises in the talents it uncovers. Embedding has been disabled so if you haven't seen Susan yet, just click this.